Left and Write: U: Union Jack! Originally an operative for the British government, Lord James Montgomery Falsworth was first active during World War I as Union Jack. It was during this time that he first encounters a skinny saboteur named Baron Blood....a vampire working for the Germans. During World War II, Union Jack was active again, this time joining The Invaders after the original Human Torch saves his daughter's life via a blood transfusion after another run in with Baron Blood. The transfusion giving Jaqueline Falsworth the power of super speed which she uses while adopting the costumed identity of Spitfire. After the attack, James finds out the Baron Blood is really his brother, John. A battle ensues and Blood crushes Jame's legs, ending his career as a crime fighter. James retaliates by impaling his brother on a silver veined stalagmite and ending the threat of Baron Blood...for the moment. After this, he quits the Invaders, but still travels with his daughter in a wheelchair before officially retiring after his son (who James had recently passed the mantle of Union Jack on to) is killed in a car wreck. 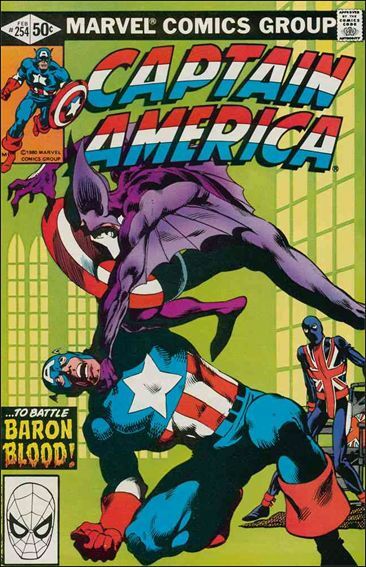 Many years later, Falsworth contacts Captain America to aid him in destroying Baron Blood...again. Come on, you didn't really think the Baron was gone....did you? After this adventure James Falsworth, already a very old man, passes away from heart failure. James Falsworth possessed no superhuman powers, but was an athletic man trained in espionage as well as armed and unarmed combat. He had a bullet proof costume as well as a six inch dagger and a .455 Webly revolver. I always thought Union Jack was a pretty cool character because, mainly, back then you didn't see a lot of heroes that weren't "American". 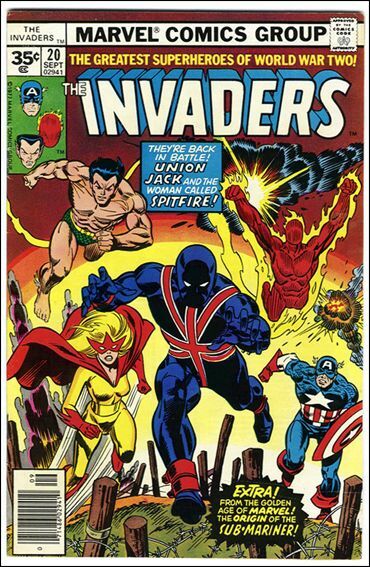 Jack and Spitfire brought an English slant to many of the Invader's stories that I used to find fascinating. Being such a huge Invaders fan, it was neat to see heroes from other countries pop up...which happened quite a bit in their book. Tomorrow we go back to the Great White North for another obscure hero....eh? somewhere i have jack as an action figure... now i need to know if it's him or some other flag carrying super hero? I'm all for diversity in the world of action heroes. Union Jack is a true go-getter. Talk about not being a quitter, damn. I never heard of Union Jack before, but he sounds like someone I'd want on my side. Between WW1 and WW2, I'm happy to see that Union Jack had other activities besides fighting crime, ergo 2 kids. wow, that's a lot of drama. It is nice to see other cultures come into the superhero field. Maybe a little garlic or Holy water on the stalagmite would've helped? I love the history and info you give on each one. I learn a little something each time! I got a bit confused. I thought he was in a wheelchair already but why was he standing in the comic with Capt America? YAY for the Brit hero. This is a cool one I can really get behind. Now, I'm going to feel compelled to go look up "V" characters. Very cool. I love the idea of a Superhero speaking in a posh Brit accent LOL. @Jeremy: Actually, I've seen quite a few UJ figures on the internet. I never realized he was so popular in toy form. @Sheena: I know, even being paralyzed can't keep him down!! @Dee: Great question, actually. I remember that used to be one of my biggest gripes about comic books, when I was younger, the fact that what happened on the cover didn't always reflect what happened on the pages inside. 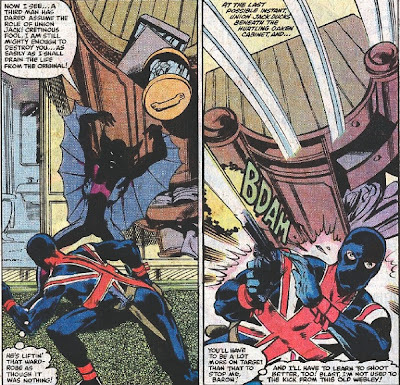 I think, in this case, though, (because I used to have this issue)..if I remember correctly, Union Jack had, somehow, regained a little bit of mobility in his legs. It wasn't much, but was enough for him give Cap a hand in defeating Baron Blood. Union Jack sounds like a cool character! I know this sounds terribly American-egotistical, but I had no idea that there were other superheroes from outside America - I thought it was a truly American obsession. Thanks for sharing all these cool characters. I can't imagine a worse combination than a vampire who was in league with Germans during WWI. Mark, I think this was a great topic for a series of posts. I have become more and more interested in Oracle as the days have gone by and I wanted to thank you for inspiring that initial interest! None of those Cap-era villains ever seem to permanently perish. At worst, you'll probably get Baron Blood's son. But they seem to have cursed Union Jack - I didn't realize his mantle came with so much rough luck. Shades of James Bond. Wonder if Ian Fleming read Marvel Comics. You sure got alot of info in this short review...power surges, vampires, life saving, invasions, bullet proof costumes and invalid super heros. Wow...this story has something for everyone. They need to bring Union Jack back. He and Captain America could be trans-Atlantic buddies! I never thought about most of the superheroes being American, but I guess they were. Hmmmm... what will V bring?? And I guess Americans just love their superheroes. Union Jack is cool. I think I remember seeing a picture of him once, but I love hearing his storyline. That's a great name for a superhero! I see you've already found your award at my place. :) It was your A to Z series that made me think of the Superhero question, btw. Nice to see some British heroes. He sounds like a thoroughly good egg. Hard life, though. I believe I've said it before--but I love how all these comic characters intersect with each other! @Lee: I know, I think it truly represents how evil the Nazis were. @Suze: Thank you very much and that's quite a compliment! If you like female heroes, a mini-series my wife really liked, Marvel Divas, might be up your alley, too. Superheroing from a female point of view. Also the Dan Slott run of "She Hulk" was also well done. @Elizabeth: Well, never say 'never' in the Marvel Universe. If the right story comes up, Union Jack could rise again. @Diane: Most were, yeah....though they did throw some others in for international flair. @Robin: I totally agree. I miss those times. @Christine: You probably did see him pop up somewhere...the name spanned a few generations. @Nicki: I did see that and thank you again...I really appreciate it :) Heh, I thought it might have, but didn't want to just assume. Glad you're enjoying! @Allison: I think it's always a neat aspect of the comics, when they team up, etc. Sad end to his life; legs get crushed, wheelchair, son dies, heart failure. It sure isn't all fun and games being a superhero. Perhaps they were trying to appeal to UK audiences? It's fascinating how many stories involve vampires working for the Germans. I like Spitfire. @mshatch: Yeah, he had a rough go of it. I do like his costume. The villains are never really gone...are they? Union Jack sounds like a pretty cool character. Just one thing. His name. Is. Awesome. An English superhero this time. That makes a change. America seems to be superhero central. it's interesting to see heroes from other countries too. I am amazed at the variety of super heroes there are. I had no idea until your posts. Thank you for sharing. Another interesting and obscure character... I never hear of this guy before. Then again, I haven't heard of MANY of your featured heroes LOL. I am getting a good education in comic heroes through you Mark. I liked him too for the same reasons you did. I like almost anything "British" you know... lol. I only read one or two comics with him in there but I liked his costume a lot.